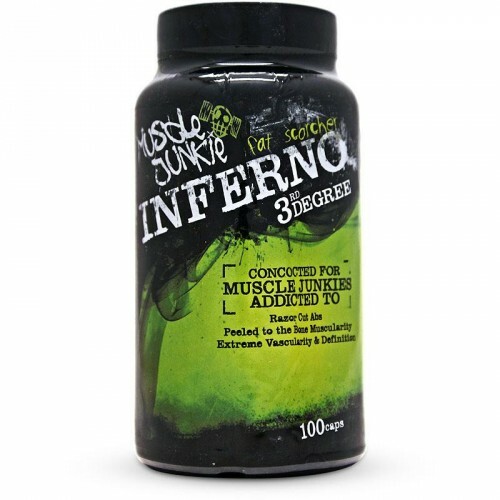 Muscle Junkie Inferno is a fat burner for athletes addicted to razor cut abs and peeled definition. Fitness athletes on a fat loss program eat fewer calories which results in reduced energy. The lack of energy will negatively affect workout performance. Each serving of Inferno will give you 167 mg of caffeine for increased energy so that you still train at your peak while losing fat. Fewer calories not only result in less energy but may also reduce mental focus. This product includes the stimulants caffeine and higenamine which will keep you focused at work and during your gym sessions. Included is Cocoabuterol™ which is a trademarked ingredient derived from natural cocoa extract produced by Genabolix. 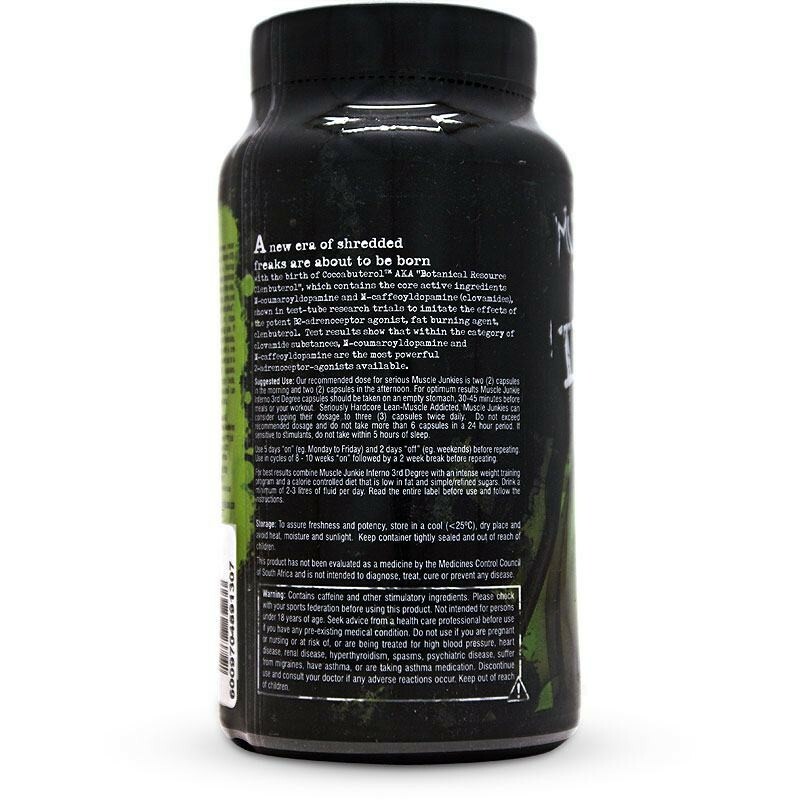 Research around the active compounds found in the ingredient have studied the effects of fat loss and lean muscle gain by improving anabolism and inhibiting P-selectin expression and platelet-leukocyte interactions. 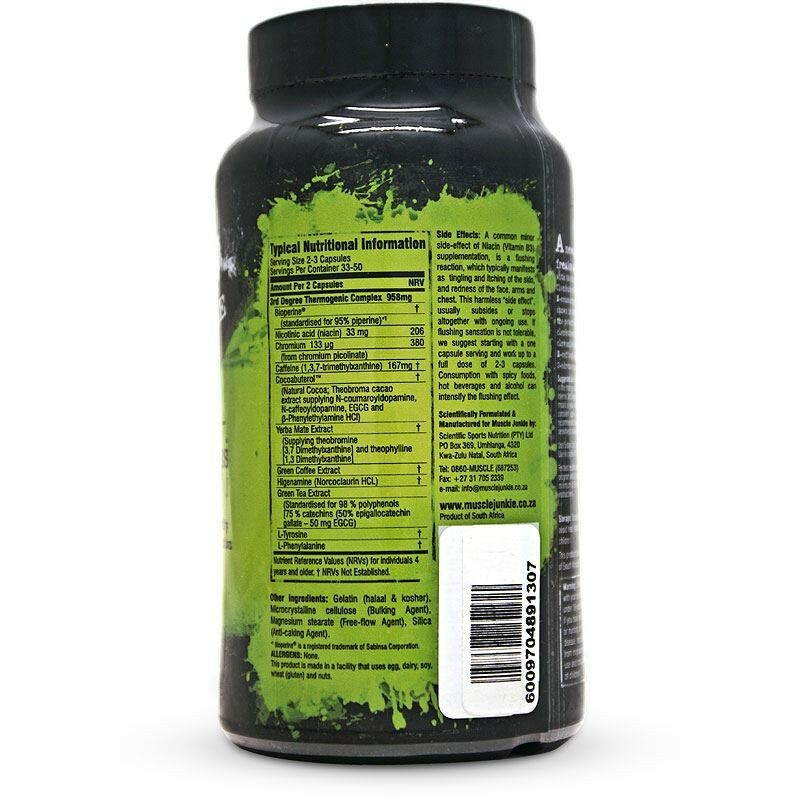 To enhance the uptake of the ingredients the manufacturers have included Bioperine™ and Chromium to improve the effectiveness of the fat burning compounds. Muscle Junkie Inferno is a fat burner and workout performance booster using trademarked ingredients which delivers a quality product at an affordable price to athletes on a fat loss program. At 50 servings per bottle the product offers true value for money! Nutrient Reference Values (NRV's) for individuals 4 years and older. Other Ingredients:Gelatin (halaal & kosher), Microcrystalline cellulose (Bulking Agent), Magnesium stearate (free-flow agent), Silica (anti-caking agent). • Each serving is two (2) capsules. • To assess tolerance start with one capsule before taking the recommended dose. • Recommended dose is two (2) capsules in the morning and two (2) capsules in the afternoon. • For optimum results servings should be taken on an empty stomach, 30 – 45 minutes before meals or your workout. • If sensitive to stimulants do not take within 5 hours of sleep. • Use 5 days “on” (e.g Monday to Friday) and 2 days “off” (e.g. weekends) before repeating. • Use in cycles of 8 – 10 weeks “on” followed by a 2 week break before repeating. Contains caffeine and other stimulatory ingredients. Please check with your sports federation before using this product. Not intended for persons under 18 years of age. Seek advice from a health care professional before use if you have any pre-existing medical condition. Do not use if you are pregnant or nursing or at risk of, or are being treated for high blood pressure, heart disease, renal disease, hyperthyroidism, spasms, psychiatric disease, suffer from migraines, have asthma, or are taking asthma medication. Discontinue use and consult your doctor if any adverse reactions occur. Keep out of reach of children.